Require promotional tools to drive sales through store-front displays? Scribo Displays offers you weather-resistant, attractive and cost-effective poster sight cases with durable aluminum frames. The aluminum frames of these poster sight cases have hidden pre-drilled holes and can be mounted high up on walls to enhance the visibility of your store-front displays. The posters that are fixed on these poster sight cases are held in place in polycarbonate poster covers with magnetic seals. The users of these poster sight cases can also change the posters on display very easily. Spare a few minutes to take a tour of our collection of cost-effective and durable poster sight cases. 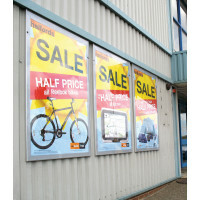 You stand a very good chance of finding the most suitable poster sight cases for your outdoor displays.